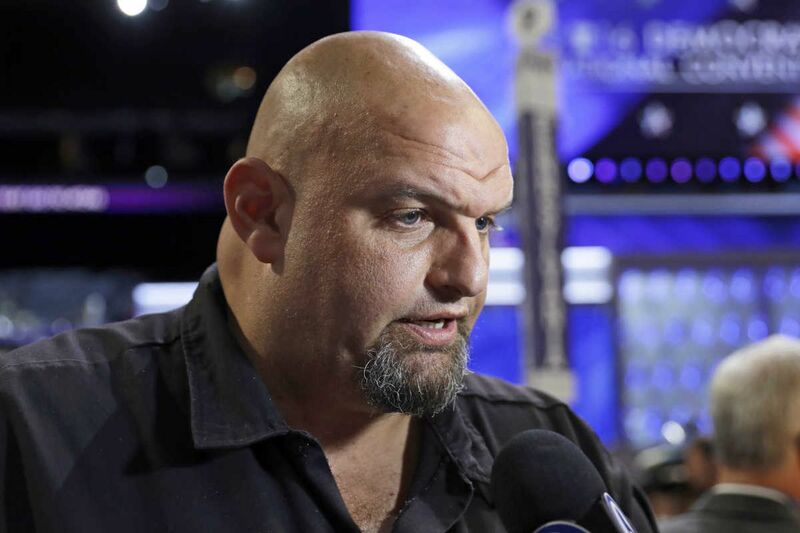 FILE – In this July 27, 2016, file photo, John Fetterman, mayor of Braddock, Pa., talks to a reporter on the third day of the Democratic National Convention in Philadelphia. On Tuesday, Nov. 14, 2017, Fetterman became the latest Democrat to announce he's willing to challenge incumbent Pennsylvania Lt. Gov. Mike Stack in the party's primary for the 2018 election. BRADDOCK, Pa. – John Fetterman, the charismatic and tattooed mayor of this Pittsburgh suburb who ran a fiery but unsuccessful campaign for U.S. Senate last year, announced his campaign for lieutenant governor Tuesday morning. "I'm going to be going out all across Pennsylvania, campaigning town to town [in] many of these forgotten places — second-chance cities, whatever you want to call them — that have become my professional passion," he told about 100 supporters in a Braddock theater space. He pledged to fight for progressive issues including a higher minimum wage, better police-community relations, and marijuana legalization. Fetterman, who typically sports a Dickies-shirt-and-cargo-shorts ensemble, opened his five-minute speech with a joke at his own expense. "Everyone is here for a major announcement," he said. "I'm wearing long pants today." A lieutenant governor presides over the state Senate, whose rules require a shirt and tie. Fetterman said he had no intention of changing his style, or his address. Lieutenant governor candidates run separately from those for governor in primaries, then together in the general election. Fetterman is among candidates challenging incumbent Lt. Gov. Mike Stack, a former Philadelphia state senator mired in controversy around allegations of mistreatment of staff and state troopers. Stack is not close to Gov. Wolf. Fetterman said that he spoke to Gov. Wolf's team prior to deciding whether to run, and that they raised no objection — although "they're staying out of it. They're not weighing in on the race." He would, he said, be "a progressive backstop" for Wolf. His campaign was endorsed by Pittsburgh Mayor Bill Peduto. Peduto said that although much of contemporary politics foments division between communities, "There's no one talking about the similarities" between the challenges faced by inner-city communities and more rural areas. "What is needed … is somebody who can not only speak for all, but who has proven through their leadership in a community that has been knocked down to its knees," he said. When he ran for Senate in 2016, Fetterman finished third in a four-way Democratic primary won by Katie McGinty, with 20 percent. But he won Allegheny County handily and finished second in other southwestern counties. Fetterman grew up in York, and earned a master's degree in public policy from Harvard University. He moved to Braddock after participating in an Americorps program that helped people earn high-school equivalency degrees, and ran for mayor in 2005, winning by a single vote. Also running for lieutenant governor are one-time congressional candidate Aryanna Berringer and Chester County Commissioner Kathi Cozzone.